Listeners to Seán Óg Ó Ceallacháin’s broadcast on Sunday nights of the nationwide GAA club results might be familiar with the name ‘JK Brackens’ of Templemore, Co. Tipperary, named after one of the founders of that organisation. While Bracken was a notable figure in his time through his interesting and turbulent career in the GAA, the Fenians and local government, he has been overshadowed by his more famous son, Brendan Bracken, the newspaper magnate and Churchill’s wartime minister for information and close confidant, who was subsequently created Viscount Bracken of Christchurch. While the career of his mysterious son has been well explored, that of J.K. Bracken has remained obscure. Over the next ten years he was at the centre of affairs and sought to straddle the uneasy alliance between hard-line nationalism and bourgeois respectability, which jockeyed for position within the fledgling organisation. The drive and energy displayed during his involvement with the GAA were also evident in his business life. The family stone-cutting and monumental business expanded under his management to include building and road contract work. 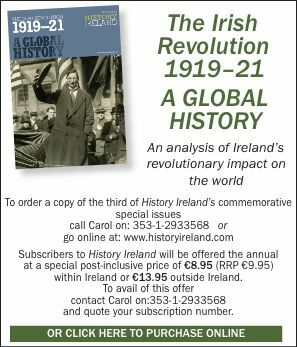 The centenary celebrations of the 1798 Rebellion, allied to his high standing as a nationalist, helped him to secure many contracts. These included the 1798 memorial in Clonmel, one to the Manchester Martyrs in Kilrush, a Celtic cross which commemorates the Fenian, Peter O’Neill Crowley, killed near Mitchelstown, and a memorial tablet on the grave of Nicholas Sheehy in Shanrahan cemetery in Clogheen. The Celtic crosses and other tombstones found throughout the cemeteries of the neighbouring countryside carved with the legend ‘Bracken Templemore’ also bear testimony to his life’s work. Bracken’s involvement in local politics was relatively short-lived and tempestuous. Though he topped the poll in the local elections for the newly created Templemore urban district council, his authoritarian temperament and Fenian background did not make him suitable for the cut and thrust of local politics. As Nancy Murphy, in her essay on Bracken in Tipperary: history and society, writes: ‘the Brackens now commenced a pattern of behaviour which eroded their standing’. This included installing his wife as chairman of the UDC when business conflicts disqualified him from attending meetings, as well as undertaking a series of legal actions against the council. This led to the termination of his career as a public representative, and to his leaving his native town and county. Probably the last straw was a court case that he instigated as a result of a collision between his pony and trap and the carriage of the local landowner, Sir John Carden. The local court found against him and, as Charles Lysaght, the biographer of his son, Brendan Bracken, puts it, ‘Furious that his own people had let him down, he decided to shake the dust of the town off his feet’. Just turned 50, he moved 40 miles south to the town of Kilmallock in 1902. He died of cancer 100 years ago on 2 May 1904 and was buried in the nearby cemetery of Tankardstown, where a Celtic cross marks his grave. A tribute after his death stated: ‘He was one of the old guard, or as better known, one of the Fenian band’. 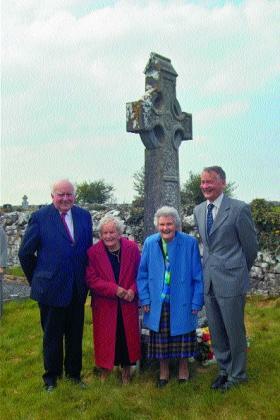 The tribute continues that Bracken ‘had refused a seat in parliament because he did not want to take two oaths—one to the sovereign and one to the Irish Republic’. Whether his son, the future Viscount Bracken of Christchurch and sometime member of His Majesty’s Privy Council, was aware of this tribute is unknown. What is known is that any reference to his Fenian father was censored by Bracken during his period as minister for information during the Second World War.